Reentrant atrioventricular nodal tachycardia (AVNRT), it is the most frequent supraventricular paroxysmal tachycardia in healthy hearts, and may represent 60% of them 1. It is more frequent in women and in intermediate ages especially between 40-50 years. Although AVNRT is usually very symptomatic, it has a long-term benign prognosis and can be cured by invasive procedures. For the appearance of the nodal AV reentrant tachycardia, an anatomic substrate near the AV node is required, with the presence of two conduction pathways: a fast pathway with long refractory period, and a slow pathways with short refractory period. During the sinus rhythm the impulse is transmitted by both ways, but it reaches the bundle of His through the fast pathways. Three types of AVNRT have been described: common AVNRT (slow-fast), uncommon AVNRT (fast-slow) and slow-slow AVNRT. It is the most frequent AV nodal reentrant tachycardia, up to 90% of all cases. It presents anterograde conduction through the slow pathway, and retrograde conduction through the fast pathway. It is usually triggered by a premature atrial complex in the fast pathway refractory period (unable to conduct), so the stimulus is conducted by slow pathway. 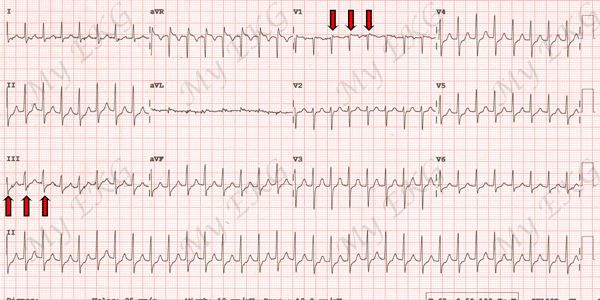 Narrow QRS complex tachycardia. Red arrows indicate pseudo R' wavesin lead V1 and pseudo S wave in lead III (retrograde P waves). When the stimulus is transmitted slowly, it will give time for the fast pathway to recover its conduction capacity and when the stimulus arrives where both pathways join (close to the bundle of His), it will be conduct at the same time by the bundle of His towards the ventricles and by the fast track, retrogradely, to the atria, causing a new atrial stimulus called echo. The echo stimulus will descend again through the slow pathway (the fast pathway will be in the refractory period) and the process will be repeated, perpetuating the AVNRT. It represents 10% of AV nodal reentrant tachycardia. It presents anterograde conduction through the fast pathway and retrograde conduction through the slow pathway. After an premature atrial complex, the stimulus is conducted by the fast pathway and when it reaches the junction point of both pathway it found the slow pathway with conduction capacity, so it is transmitted to the ventricles by the bundle of His and the atria by the slow pathway. The stimulus returns by the fast pathway and thus the tachycardia is perpetuated. As the stimulus is conduct by the slow pathway to the atria, atrial depolarization will occur after ventricular depolarization. In the slow-slow form, the two slow pathways are used for both anterograde and retrograde activation 2. As we discussed, the AVNRT It is more frequent around 40 years of age, and more in women than in men. The main symptom is palpitations, although it can also be accompanied by dizziness, vertigo and chest pain. In patients with other cardiac pathologies, it may present with episodes of angina or heart failure. It is important the previous history of similar episodes with abrupt termination that can help us with the diagnosis. The electrocardiogram of AV nodal tachycardia the reentrant is characterized by a regular narrow QRS tachycardia, except in the presence of a previous bundle branch block. AVNRT is rhythmic and usually has very high heart rates which can exceed 200 bpm. If P wave is visible, it will be negative in inferior leads, because atrial activation is produced from AV node, due to retrograde stimulus. Each type of AVNRT presents different characteristics in the Electrocardiogram. Narrow QRS tachycardia. Pseudo R' waves in V1 (retrograde P waves) in red. In common nodal AV reentrant tachycardia or slow-fast, almost simultaneous atrial and ventricular stimulation occurs, therefore, P wave frequently is included within the QRS complex. This is difficult to determine on an EKG at high heart rates. It can be observed as a pseudo R' wave in lead V1 or as a pseudo S wave in inferior leads, both waves are not present in nromal sinus rhythm EKG. Narrow QRS tachycardia. Red retrograde P waves after QRS. In this case, atrial depolarization is delayed because the stimulus is conducted through the slow pathway, so P wave will be visible (always negative in inferio leds) after the corresponding QRS, usually before T wave. As in common AVNRT RP interval is shorter than PR interval. The acute treatment of AV nodal reentrant tachycardia is based on decrease AV conduction to stop the arrhythmia. Initially, vagal maneuvers should be attempted (massage of the carotid sinus or valsalva maneuver). If it fails, adenosine IV may be used at successive doses of 6 mg and 12 mg. Adenosine is a very short acting drug (6 seconds) and causes transient AV block which may interrupts tachycardia. It is contraindicated in asthmatic patientes, in pulmonary hypertension and in acute coronary syndrome. Adenosine must be administered by experienced medical personnel, and the patient must be monitored at all times. A prolonged electrocardiographic recording is recommended during the seconds after its administration to record the interruption of the tachycardia. In case adenosine is not effective, beta-blockers, diltiazem or verapamil may be administered. Patients should be instructed in the use of vagal maneuvers to end tachycardia. Beta-blockers or verapamil may be used chronically to prevent events. Catheter ablation of the slow pathway is the definitive treatment of AVNRT, with a success rate of over 95% in most experienced centers. Poor pharmacological control or intolerance to drugs. Presence of underlying structural heart disease. Patient's preference for the procedure. 1. Almendral J, Castellanos E, Ortiz M. Paroxysmal Supraventricular Tachycardias and Preexcitation Syndromes. Rev Esp Cardiol. 2012;65(5):456-69.